382 x 278 mm. - 328 leaves, 53 large miniatures in two columns. With a contemporary binding, in blind tooled calf over wooden boards, and with brass bosses and clasps. 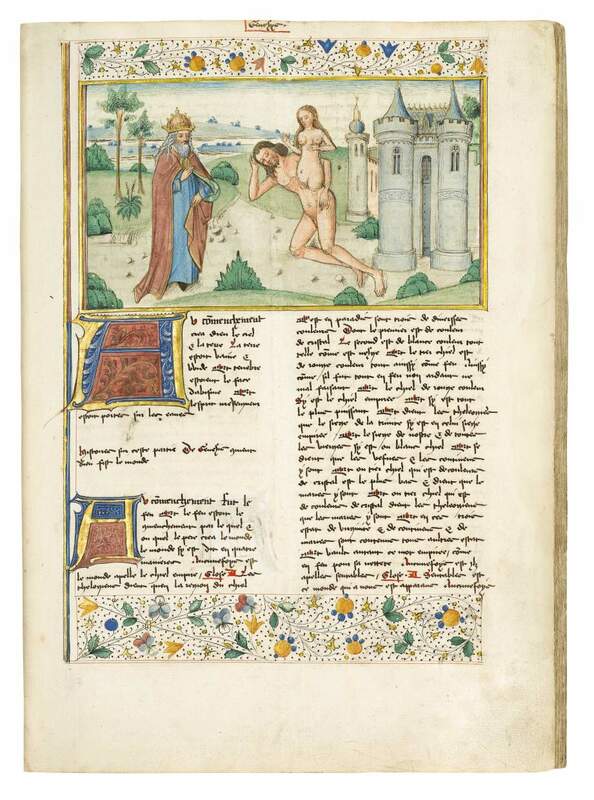 The 'Bible historiale' is one of the principle works of medieval literature. In this French translation, it unites all the books of the Old and New Testament. 382 x 278 mm. – 328 leaves, 53 large miniatures in two columns. With a contemporary binding, in blind tooled calf over wooden boards, and with brass bosses and clasps. At the end of the 13th century, Guiart (or Guyart) des Moulins created the French Bible historiale in the form of a history book, using Petrus Comestor’s Historica scholastica and the Latin Vulgate Bible. The Bible historiale was by far the most popular French translation of the Bible, reading more like a chronicle or a novel, and was thus more suitable for laypeople. The present manuscript is layed out spaciously, with much blank parchment between chapters. Evidently, the unknown commissioner was interested in having a sumptuous codex, as is demonstrated by the fact that the miniatures, in the form of large, penwork drawings, extend over the whole width of the written space, rather than being kept to the usual, column-width, and that many of the initials are added in gold. Furthermore, the commissioner must have had specific interests, judging from the allocation of the miniatures. The history of Samson received three miniatures, (ff. 137, 138, 138v), that of Jezebel (ff. 192, 201), Judith (ff. 253, 257v) and of Esther (ff. 263v, 266v) two miniatures each. The Apocalypse has as many as four miniatures (ff. 300, 311, 317, 321). In accordance with their unusual subjects, the compositions are inventive and unusual. The vivid illustrations with their unusual themes are not typical for a Bible Historiale and they reveal a patron with specific theological interests. This manuscript, with its contemporary binding, is a treasure whose secret is yet to be revealed.